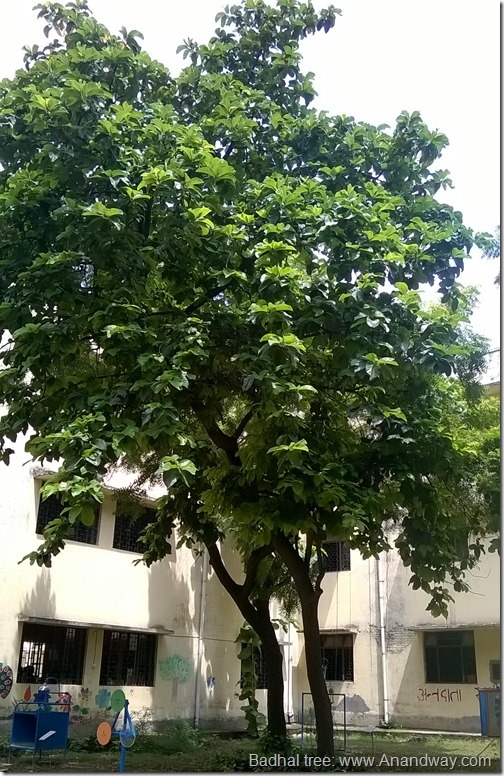 Badhal is a tall deciduous tree which loves to grow in moist forests. It is found at altitudes up to 1800m. 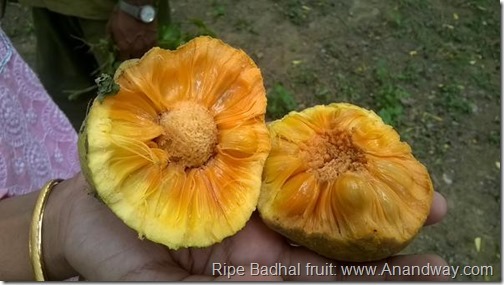 It is a native of India and belongs to the family Moraceae. Badhal is also called Artocarpus lakoocha, Dheu, Dahe, Lakuch, Lakoocha and Monkey Jack. Badhal for food, medicine and furniture! 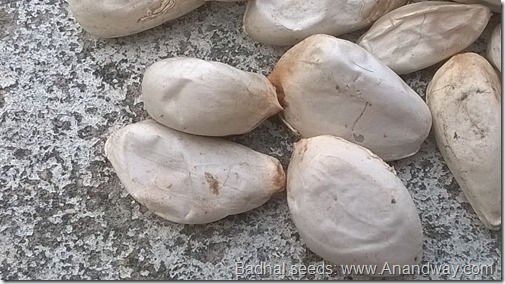 Badhal is famous in Punjab as Dheu, and makes a popular pickle ‘Dheu da achar’ when unripe. 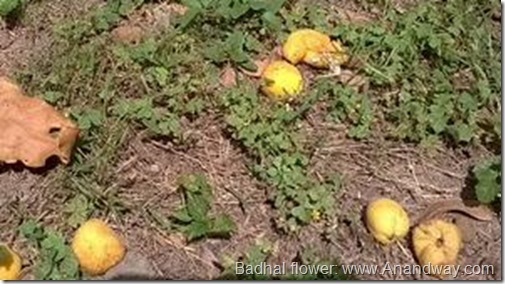 The Badhal flower and unripe fruit is used for making sabji or a a variety of vegetable dishes. Being sour, the unripe and ripe fruit is dried and used as a substitute for tamarind in recipes. In Punjab, Rajasthan and Haryana Dheu is dried and used in curries too. It’s bark is chewed like betel nut in Assam. 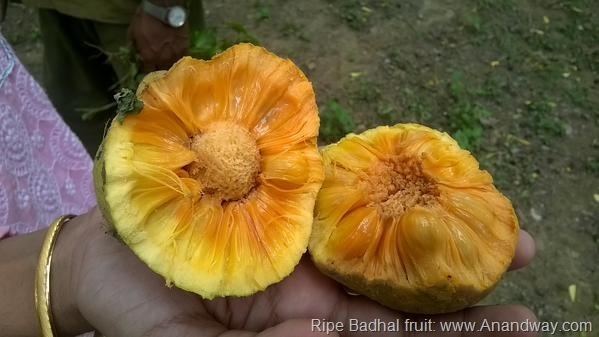 The ripe fruit is eaten in all places that the tree grows in, including Uttar Pradesh, Punjab, Haryana, Rajasthan, Assam, etc. Badhal tree wood being as strong as teak, is useful in house construction work, medium weight furniture and boat building. This Badhal tree inside La Martiniere Girls’ College, Lucknow, (in Uttar Pradesh, India) stands quietly except in late summer when birds make merry on its bright yellow, sweet fruit. 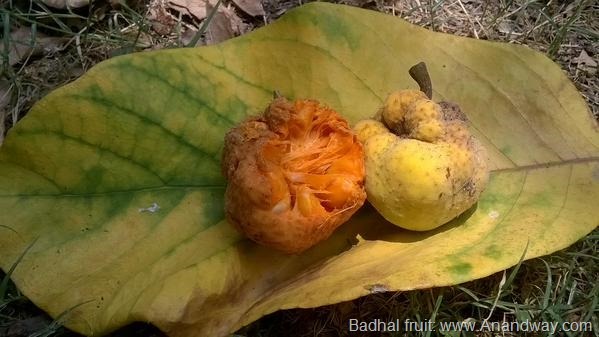 I found the fruit tasting a bit like custard apple; may be because of the number of seeds in badhal and custard apple. Incidentally, the similarity doesn’t end there. The seeds of both fruit can be saved and easily sprouted to make new trees :) I am doing that now in the rainy season! Dheu trees grow from seed, and take 6-10 years to bear fruit.